Popular Photography is the world’s largest photography magazine and the leading technical authority, buyers guide and how-to resource for the photo enthusiast. Flying holds a special place in the world of general and business aviation. It has been the voice of aviation since Lindbergh departed Roosevelt Field for his historic nonstop transatlantic flight to Paris in 1927. Its mission is to inform, educate and entertain pilots and would-be pilots. Sound & Vision is the world’s most comprehensive and engaging home entertainment magazine. It offers the freshest editorial content in the category, with each issue bringing readers the latest products and technological breakthroughs in home theater, audio, video and multimedia products. American Photo offers a unique visual environment and an authoritative editorial voice which inspire and inform an audience of advanced photography enthusiasts and photo professionals. Hachette Filipacchi Media U.S.’s brands (www.hfmus.com) reach consumers through magazines, online and mobile content, as wel as other extensions including books, television, radio and branded events. The company’s editorial hallmark is trusted expert content along with independent product testing. Our prestigious brands fall into four sectors: Fashion (ELLE, ELLEgirl); The Luxury Design Group (ELLE DECOR, Metropolitan Home and PointClickHome); Women & Health (Woman’s Day, Woman’s Day Special Interest Publications); and Automotive and Motorcycling (Car and Driver, Road & Track, Jumpstart Automotive Media and Cycle World). HFM U.S. is part of Lagardère’s (www.lagardere.com) media division Lagardère Active, a producer of special-interest content in more than 40 countries. 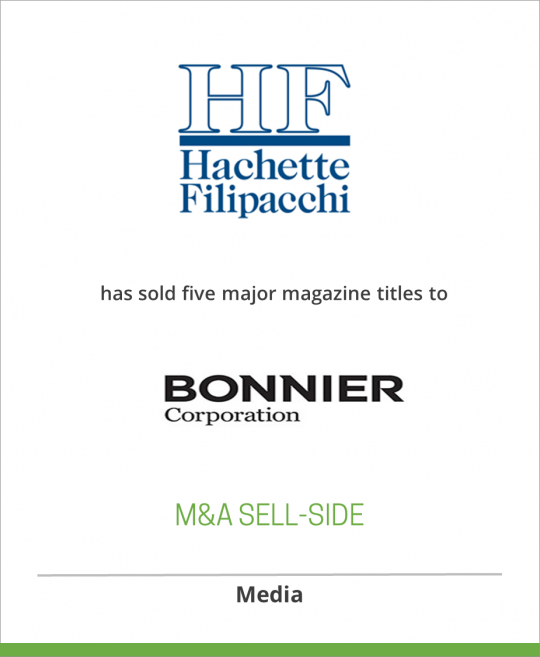 Bonnier Corp. (www.bonniercorp.com) is one of the largest consumer-publishing groups in America and is the leading media company serving passionate, highly engaged audiences, through 49 special-interest magazines and related multimedia projects and events. Bonnier Corp. is the U.S. division of the Bonnier Group (www.bonnier.com), a 200-year-old family-owned media group base d in Sweden with business operations in 25 countries.